Warsaw City Councilman Ron Shoemaker speaks during his town hall meeting Thursday evening. 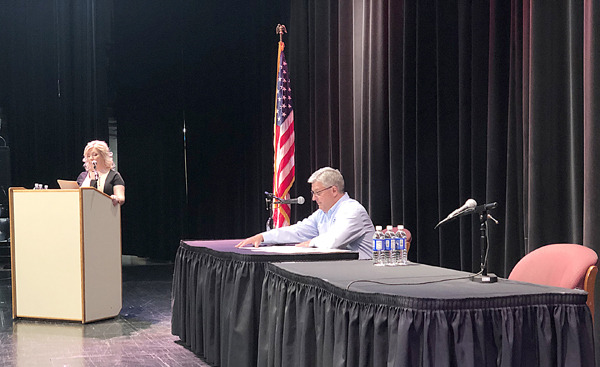 Shoemaker, who is running for Warsaw mayor against incumbent Joe Thallemer, scheduled the two-hour event at the Shrine Building at the Kosciusko County Fairgrounds instead of attending a mayoral debate organized by News Now Warsaw at Lakeview Middle School. About 50 people attended in the first half hour, including City Councilwoman Cindy Dobbins, former mayoral candidate Jerry Opperud, County Commissioner Bob Conley and former Fair Board President Mike Loher. 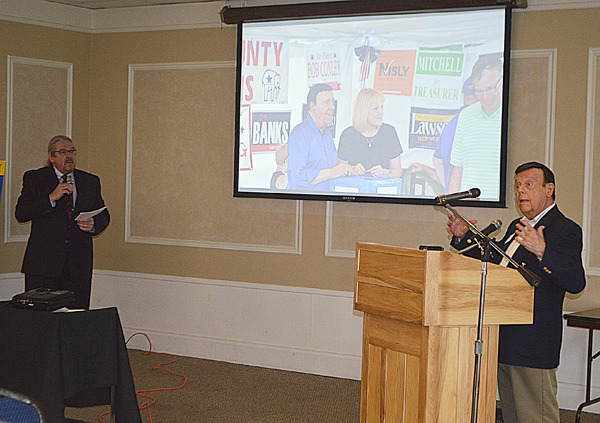 The event was emceed by Michael Alspaugh (L), a former mayoral candidate. Shoemaker didn’t give a speech but answered questions from emails read by Alspaugh and then took questions from the audience. Photo by David Slone, Times-Union. Warsaw Mayor Joe Thallemer (seated) prepares to take 16 questions submitted by members of the community read by four panelists – Joshua Short, WNDU-TV; Dan Spalding, InkFreeNews; Emily Sutton, WCHS student body president; and Gary Gerard, Times-Union general manager. The event was sponsored by News Now Warsaw 1480 AM and 99.7 FM and moderated by News and Content Director Carli Luca (L). Thallemer’s opponent in the May mayoral primary, Warsaw City Councilman Ron Shoemaker, chose not to attend the event, instead opting to host his own “listening tour” a few blocks to the east at the 4-H Fairgrounds. Thallemer said the most pressing issues facing the city include plans for the U.S. 30 bypass, the opioid crisis, workforce development and affordable housing. Photo by Gary Gerard, Times-Union.